Metabo has a pretty solid track record with us when it comes to dust extraction and collection. After all, their corded HEPA All-Purpose Vac won our Best OSHA-Compliant Dust Extractor Shootout at the end of last year. This time, Metabo has developed up a smaller, more compact HEPA vacuum, and this time, it’s cordless. The Metabo 18V Cordless Vacuum runs off the brand’s 18V battery packs for untethered dust collection convenience. This 16-pound vacuum comes equipped with a HEPA filter and a manual filter cleaning mechanism to give you some OSHA-compliance options. It generates 120 hPa on the suction end of things. For those of us not working with hectopascals, expect 74 CFM. That level of suction won’t do you much good with Table 1 grinder applications, but look for Objective Data and non-CFM specific ways to stay compliant with silica dust. 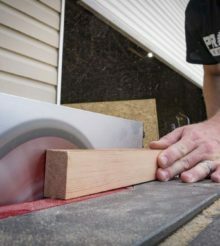 When it comes to other areas like woodworking, you’ll have enough pull to keep sanding and sawing under control. Conveniently, Metabo places the power button on the corner. Yes, they designed it specifically to kick on or off with your foot. Metabo has taken some steps to keeping this vacuum tidy. While it does look a little clunky with its boxy design, it stacks together with other tools in the brand’s MetaLoc line. All of the hoses, nozzles, and batteries store away onboard. Metabo has even designed a rolling board for the cordless vacuum to lock onto and roll around on. You’ll have to buy that separately, though some dealers are offering it free with the vac through December 31, 2018. The Metabo 18V Cordless Vacuum retails for around $200 as a bare tool. Rumor has it that a kit may also be available once it starts hitting stores. Build me a vac with a flat top, and a accessory plug for my battery chargers please. I already use a Christmas tree remote control zip tied to the hose.